From the bestselling author of The 5 Love Languages comes a beautiful gift for every couple looking to deepen their relationship with one another--and with God. Are you and your spouse speaking the same language? He sends you flowers when what you really want is time to talk. She gives you a hug when what you really need is a home-cooked meal. The problem isn't love―it's your love language. 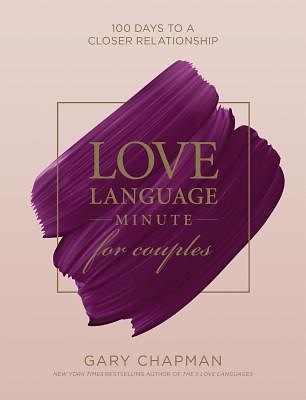 Adapted from The One Year Love Language Minute Devotional, this 100-day giftable devotional is perfect for the couples in your life--or for you and your spouse As you learn how to express heartfelt love to your loved one, you'll find yourselves deeper in love and growing closer to God--together--as a result. Pre-Order This Title Order now, item will be available on 9/1/2019. Ships from a Cokesbury Connect Partner.